Thresholds have a mechanism to average over a number of samples. Therefore, when a bar has a threshold attached, it can show you the average over a number of samples. The value displayed is the current value. 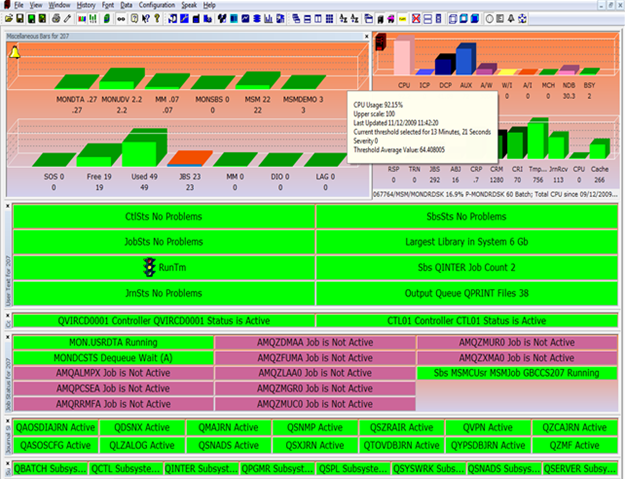 Hovering over the bar shows the threshold average value across the samples. 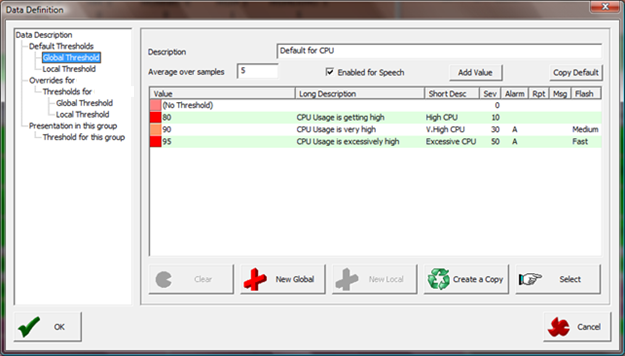 CPU has a threshold averaged over 5 samples, with an alert value of ten. If the first 3 samples are 5, 5, and 5, no threshold would be triggered as 5 + 5 + 5 ÷ 3 = 5. If the next value is 50, the threshold will be triggered, since 5 + 5 + 50 ÷ 3 = 20. If the next value had been 17 instead of 50, the threshold wouldn't have been triggered because 5 + 5 + 17 ÷ 3 = 9. So, using Average over samples is a handy way of removing alerts caused by one-off peaks. Following is an example based on a TCP Ping, created to be averaged across 5 samples. This definition also has a Collection Frequency parameter, which allows greater flexibility. In this example, 10 collections = 300 seconds and 5 samples = 1500 seconds, so the average is covering a period of 25 minutes.